Question: You indicate that globalization consists of supply chains which cut across national boundaries and that the mobility of commodities and services reinforces the mobility of labor. You estimate there are more than two hundred million economic migrants in the world today. Given these trends, how important is it for corporations, in their management structure—even in the composition of their board of directors—to embrace cultural diversity? Richard Scase: In many countries in the West, and in Japan, the boards of major companies still consist of older men: male, pale and stale. Whether it is senior management, middle management or appointed boards, these companies do not reflect the global scope of their operations in terms of cultural diversity. While there is some movement in the right direction, progress is slow. In the United States, if Barack Obama becomes President it will set an important precedent for the business community. The USA has so many global companies with offices in cities like Hong Kong, Paris and Athens that if Obama becomes President the impact on the business world will be palpable. Much more work needs to be done installing greater cultural and gender diversity in the management and boards of companies. When this happens, it will inject imagination, new ideas and innovation into strategic decisions which will better reflect the needs of organizations and their customers. Question: Tolerance of non-conformity and individuality in terms of attitude, behavior, dress code and lifestyle is a characteristic businesses must adopt if they want to employ the iPod generation. What do employers receive in return? Richard Scase: The iPod generation can be a difficult group to manage if not handled in the proper ways. These are individuals who are focused on their personal creativity and have a mindset that is adverse to conformity. They are also the leaders of the future who want to work now in business environments where their creativity has room to flourish. It won’t be long before they are managing organizations which have very different kinds of structures and processes compared to the dinosaur corporations that have grown old over the past thirty years. In return for managing these employees who are ambitious in their own distinctive ways, employers have access to people who are allowing companies to re-invent themselves. Properly managed, this generation will use its ability to visualize, innovate, and explore new business environments to assist in the transition to a knowledge-based economy. This means organizations will be looser at the top as is already occurring in media and software companies and, to some extent, in the advertising industry where this leadership approach is settling in for the future. Question: You point out that as businesses abandon traditional management structures, including operational processes based on hierarchical control, in order to develop specialized, high-value products and services for affluent consumers in emerging markets, it is important to leverage creativity as a competitive advantage. Ideas, imagination and innovation require a different management approach. Would you please elaborate? Richard Scase: Yes, as I touched on in your last question, the shift we are seeing is from management to leadership. In the last century management by definition was about managing behavior—about scientifically monitoring and controlling behavior and outputs. Employees in these types of organizations responded by doing what they were required to do according to their job descriptions. So often I have seen individuals with creative ideas being viewed as undermining the boss and the directions of the company. Many organizations purport to encourage creativity and innovation but much of this is rhetoric and not built into the culture. In terms of leveraging and encouraging creativity we require leadership that motivates, inspires, empowers, and asks questions with a sense of vision. These are the leaders who gain the admiration, inspiration and commitment of their employees—employees who want to work in an environment of trust where their ideas contribute personally and meaningfully to the organization’s performance. Question: Would you talk about the concept of lifestyle tribes and how they are impacting consumer markets? Richard Scase: Historically, marketing categories are based on traditional demographics of age, occupation, income, and gender. These demographics still have a predictive capacity, but a capacity that is declining every year as they are no longer stable enough to be predictors of lifestyles. This is because in the Western world we now have fluctuating lives. We have far greater changes in our personal and professional lives than previous generations. The predictable pattern of growing up, marrying in our early 20s, having children who eventually leave home, and growing old together into a quiet retirement is no longer valid. Nowadays we have much greater diversity in our personal relationships and careers. A glance at the over fifty generation will see that increasingly there are changes at home, at work and in their social and recreational activities. A case in point is the stereotypical assumption about people who ride Harley Davidson motorcycles. At first glance they all look the same with their leathers, helmets and consistent apparel. If you look closer, when they take off their helmets, you might see a young female doctor, an older male architect, a female middle manager, and so on. There is a great diversity of age and occupation, and an equal mix of gender—but all are united in their commitment to the Harley Davidson lifestyle. This is a lifestyle tribe. In the past, young couples would have children in their early twenties. Now couples are having children in their late twenties, early thirties, and even later. As a result, historical demographic predictors are no long reliable. In some ways, they are actually a lazy way of attempting to analyze the market place. The emergence of lifestyle tribes suggests we need to build categories and clusters of data based on lifestyle and spending patterns. These indicators are quite distinct from traditional demographics. Question: Given that lifestyle tribes are based on highly specialized tastes, is this a market solely for the entrepreneur? Richard Scase: If corporations are agile, responsive to market changes, and do the work necessary to understand lifestyle tribes, they can anticipate and certainly adapt to new business opportunities. They must have strategies in place to anticipate and then respond to shifts of lifestyle tribes. The reality is that most corporations are not flexible. They tend to have conformist cultures—ones that inhibit creativity and innovation. And they spend much of their time pursuing traditional marketing categories. Therefore, what you have are tremendous opportunities for the entrepreneur. The fragmentation of markets is creating opportunities for entrepreneurial start-ups. They can enter the marketplace and develop strategies to meet the needs of consumers seeking specialist products and services. It is this type of attitude, this approach, which leads me to characterize the 21st century as the age of the entrepreneur. Question: The title of your book implies that the 20th century business model will become redundant as the decade progresses. The global remix you talk about comes with greater risks and uncertainties but also with unprecedented market opportunities. Is increased risk part of the new business world? Richard Scase: Absolutely. The new business reality comes with many risks. For example, the economic growth of North America and Europe has been driven by cheap commodity prices. Now, we are entering an era of high energy, commodity and food prices. This is a world with far greater competition in the marketplace—not just from countries like India and China, but also Brazil and Turkey. And as we have been discussing, the uncertainty and risk for corporations is exacerbated by the ongoing changes in consumer habits. We need different kinds of risk management models. Nowadays, corporations that operate with very conservative risk management models will not be able to seize new business opportunities. Companies based in the emerging markets tend to have a culture that allows them to deal with the complexities and uncertainties of political instability. It’s the Indian corporations that today are undertaking large acquisitions in Europe and the United Kingdom. In the past the game was very much in favor of Western corporations. That is changing, in part because of the cost advantage of companies in emerging markets, but also because of their attitude toward risk combined with their more entrepreneurial cultures. This approach is enhanced in the age of the Internet where a locally-based entrepreneur can run a world-wide service. Question: How will politics affect business in developing countries? For example, in China there are emerging wealth inequalities between regions that have implications for foreign investors—such as infrastructure and employment laws. How would you recommend the politicians of China deal with these issues, bearing in mind that their decisions should not be made in isolation of the global market? Richard Scase: This is a fascinating subject. When we look at China we see that in the last ten years it has invested large amounts of money in infrastructure. The Chinese government has also changed its laws regarding employment, intellectual property, copyright, and even property ownership in order to create an attractive marketplace for foreign investors. The outcome is something we would never have imagined. Even now, top rated experts, scientists and engineers are returning home to China from the United States and Europe to set up businesses or work inside rapidly growing new companies. Similarly in India where various states are adopting new laws that are attracting foreign investment for infrastructure. There is still work to be done, some sectors like media and retail are highly protective but this is changing quickly. The general direction across India is toward liberalizing laws and continuing to open the country up to global investors and global markets. Let’s not forget that in the next few years India and China combined will have four hundred and fifty million affluent consumers. Question: India and China have had deflationary impacts upon Western economies, through their provision of cheap labor and manufactured products. Is it likely that their continued growth will have an inflationary impact on the West? Richard Scase: This is certainly the case. The reason is that as their economic engines heat up India and China are pulling in so much of the world’s commodities they are having a major impact on the prices of wheat, coal, iron ore, and oil. In the past the West benefited from cheap prices for many products produced by India and China. Furniture, video recorders, televisions, and so many other electronic and household goods have actually decreased in price as a result of cheap labor in these countries. When you have two countries with a combined population of two and a half billion people, both of which having scorching hot economies, the impact on Western economies is definitely inflationary. In the 21st century we are experiencing a new paradigm where costs for commodities, food, and energy resources will remain permanently high. This is a driver for innovation. As throughout the history of humankind, when we are confronted with challenges it is our capacity for innovation that gets us through. Today, global warming and high-energy costs are drivers for innovation. This is the time when alternative energy sources will emerge as large-scale viable options. Question: Many large companies continue to believe the most lucrative innovations will be derived from internal core competencies. Alternatively, studies like the South Korean example you reference in your book reveal that the companies classified as most innovative were the ones that tried to learn continually from other sources, including their competitors. Does this suggest there is an increasing role for collaboration among businesses? Richard Scase: Yes, very much so. The drivers for innovation are occurring as a result of ongoing strategic relationships between partners. Strategic partnerships between companies still tend to be short-term, contractual, tender-based relationships. There should be far more collaboration based on long-term considerations involving the sharing of ideas and core competencies. These relationships must become the type of relationships that will ultimately roll out new products and services. Progress has been limited because of the fear companies have about losing the intellectual property they guard or that their core competencies will be stolen. Organizations are still thinking vertically, not horizontally. They are thinking within the paradigm of management, not leadership. And as a result the traditional cultural reward systems in place are barriers to collaboration. Question: You suggest that all of us—individuals, entrepreneurs, corporations and governments—must re-invent ourselves if we are to succeed in this ever-changing business world. For established businesses, and even for those starting out, these challenges can be immense, confusing and stark. Your book points to solutions that are attainable, though not without considerable effort. Are you optimistic about the future? Richard Scase: I am incredibly optimistic even with the present uncertainties in the world. The global remix of world markets offers huge opportunities for new business, innovation and the development of creative products and services. Many companies, large and small, are already seizing these opportunities. Each day in the financial pages we read how companies based in the West are redefining themselves—their supply chains, marketing, and research and development activities—as they focus on emerging market opportunities. Each emerging market is characterized by cultural anomalies, by different types of consumer preferences and aspirations. Yes, there are challenges, but the opportunities are immense. In the last couple of years it has been exciting to watch how large corporations like Unilever, IBM and the pharmaceutical companies, amongst others, have redefined their strategies to focus on emerging markets. These opportunities are not limited to large corporations. The entrepreneurial fleas—the small nimble companies—are offering a wide range of products and services to affluent consumers. Though we in the West are presently preoccupied by the credit crunch in the US and the United Kingdom, the global economy is moving along very nicely at a growth rate of five percent. Question: Technology and communications are changing the nature of the global economy. And yet, in this world of the Internet, iPods and cell phones, you argue it is more important than ever to ensure businesses develop personal relationships with customers, contractors and subcontractors. Why is that more important now? Richard Scase: Strong personal relationships, where trust and integrity are key elements, must be struck before contracts can be put in place. Even in the Internet Age, with text messaging and emails, it is more important than ever to bring people together. In fact, what we are finding is that the Internet with all its tools for communication is bringing businesses closer together. Businesses are understanding that in order to take the next steps to solidify contracts and service delivery solutions, they must meet face to face and work out the details and the cultural nuances. This is the great thing about the Internet. It does not replace face to face meetings, it actually encourages interpersonal dialogue. Question: Bill Gates says the future lies with small firms. Admiration, imagination, innovation and trust can be developed more easily in a small business. Can these attributes be adopted by large corporations? Richard Scase: Yes, they can. Some organizations will pay only lip service to these qualities and, as a result, likely perish. Entrepreneurial values that embody imagination and innovation are reflective of organizations that have shifted from management to leadership as the predominant style of running the company. Large corporations must redefine their business processes. They need to break themselves up into decentralized business units of fifty people or less. High performance organizations tend to operate with micro cells that are pooled together and managed under the corporate brand to focus on particular market niches. Question: It is well understood that the social systems of continental Europe will be unsustainable in the future. The high cost of their worker-friendly policies, along with the growing cost of their aging population, makes it impossible to compete with India and China. What are the implications of this? Richard Scase: The European Union has a real problem. An aging population combined with a declining population and therefore a declining workforce that can only be supported by inward migration is adding up to a major crisis in continental Europe. For example, the thirty-five hour work week, which has only recently been set aside by French President Sarkozy, is symptomatic of an unsustainable social system. The weight of all the social benefits negatively impacts the cost of manufacturing and production—making it impossible to compete with emerging markets. The solution for continental Europe involves a shift from collective responsibility to individual responsibility. Also necessary is a dramatic overhaul of the education system which currently does not produce people with the required skill of thinking outside the box. The education system needs to produce people with an entrepreneurial spirit which enables them to run with ideas. People with the social skills to work horizontally, across cultures. We require not just experts, or entrepreneurs, but individuals with a combination of both, who are creative and willing to explore new business possibilities. Governments in continental Europe must shift their focus and energies to a regional regeneration that encourages and supports indigenous entrepreneurship. This is because the rate of direct foreign investment is going to continue to decline in Europe. Let’s be clear, why would an investor invest in Germany when he or she can invest in other English speaking parts of the world that have unlimited supplies of labor. India and China in five to ten years time will have immense English speaking populations. Europe needs to wake up if it is to avoid becoming the Old Peoples’ Home of the world. Question: Universities continue to place strong emphasis on academic rigor. In the marketplace, we need more people with specific skills, like plumbers and electricians. This suggests our educational institutions are not preparing us well for the days ahead. Do you agree? Richard Scase: Yes, I agree. The post secondary education system still has an academic snobbery that was present one hundred years ago. It focuses on developing academics rather than young entrepreneurs who can immediately assist businesses with the kinds of challenges they face today. Skills in the trades like plumbers and electricians are not valued highly enough. Not only are these skills in high demand but they are constantly changing. The education system is not responding to these needs. Question: Retired workers in their 50s, 60s and 70s represent a huge reserve of talent. Some spend part of their week as “Greeters” at WalMart. Many in this talent pool are ready and willing to take on new challenges. How can retired workers help businesses make the changes necessary to compete in the global remix? Richard Scase: The assumptions about age and older workers are founded in the industrial revolution, when getting old made a worker less effective because of the tremendously challenging physical nature of the work. Those assumptions have been carried forward to this day. We now have labor shortages in Europe and North America, and part of those shortages is directly attributable to the assumption that a fifty or fifty-five year old worker is past his or her prime. The reality is these people are deep in experience and have strong skill sets. But often they feel squeezed out of the marketplace because of historical beliefs that are not valid in a knowledge-based economy. As baby boomers are forced out of the workplace, some are setting up shop in new businesses of their own. More often than not “retired” boomers set up a new business that is in direct competition with their previous employer. Imagine the tremendous creative contribution these individuals could make in business and government, especially in the years ahead with the challenges and opportunities of the emerging markets. In Europe, where mandatory retirement exists, this problem will continue to get worse. In countries like Italy and France where the population is expected to decline by fifteen to twenty per cent over the next twenty years, and where hardly anyone over the age of fifty works, the problem is stark. In the United States, with no mandatory retirement age, the opportunities for businesses to shift their mindsets regarding older workers and take advantage of their experience, skills and business savy is already taking place. Question: Are you planning to write another book? Richard Scase: This summer I am doing research and continuing to observe changes in the markets. In the fall I will return to the word processor. I am intrigued by the credit crunch in the United States and the United Kingdom which has had major impacts on world markets. The credit crunch in combination with increasing food prices and energy costs is a perfect storm. I am intrigued to see how corporations will adapt their strategic directions in response to these changes. A new book will likely come togetherl. Question: In addition to being a creative process writing a book takes a lot of focus, time and effort. Do you have an editorial team to review your drafts? Richard Scase: Most often I do my own editing. I will lock myself away for about six weeks during which time I will write a first draft. I tend to take a break at that point after which I come back to do additional writing. I then undertake the editing through second and third drafts. It’s a long process but one I continue to enjoy. Global Remix is an authoritative forecast of global economic and business trends over the next twenty years. Countries like India and China are challenging western businesses to adapt to the new knowledge-based economy where flexible, adaptive entrepreneurs are making inroads in emerging opportunities. 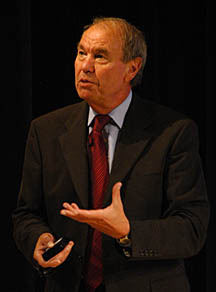 Richard Scase is Professor Emeritus of Organizational Change at the University of Kent and has held visiting professorships at the University of London, Beijing University, Auckland University (New Zealand), Monash University (Australia), Tilburg University (the Netherlands), and the University of Essex. Professor Scase co-founded and sold two successful media businesses. In addition to being the author of over 20 books, the most recent being Global Remix, Professor Scase is a frequent contributor of feature articles to national British newspapers, professional magazines and programs on radio and television. He is one of the United Kingdom’s leading business strategists and an authoritative business forecaster. Richard Scase frequently lectures to corporate and political leaders, management and professional bodies worldwide.